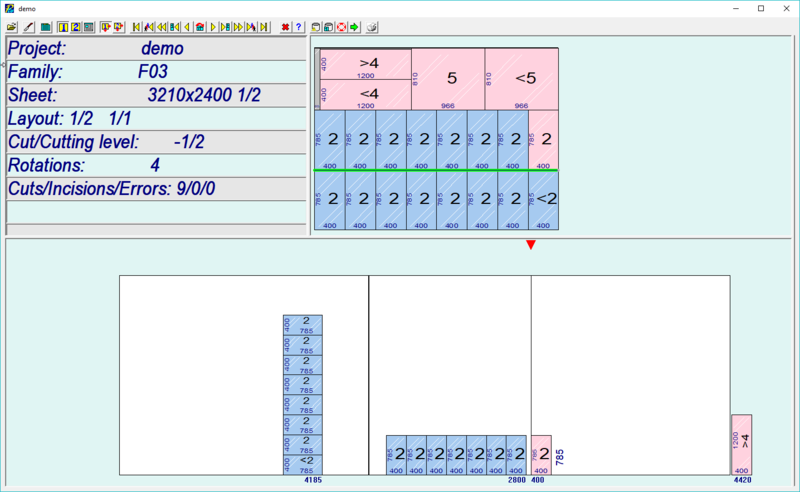 Shows the layouts on one or two screens. The operator can follow the cutting progress on a big monitor located in production, avoid printing layouts. The program shows the graduals cuts that the operator have to follow to remove the glass from the cutting table (synchronized with the machine control) or, according to the mode defined on configuration, highlights the cutting layout in a detailed way. It is possible to use a joystick suitable to production environment, which can be used to control layout visualization substituting the mouse. It is also possible to activate the synchronism option with Perfect Label that allows to print layout labels or the single output piece for the laminated cut. For the laminated glass on every layout the disposition of the scraps will be optimized considering the machine restrictions and minimizing the amount of movements. In “animation” mode and synchronized with machine operations, it’s indicated the operations that the user has to do (movements, rotations, if the glass has to be marked or it is possible to make tear / cut) and all a series of informations linked to cut that is making. In case of cutting machine with the transversals cut-off function, it’s possible to see into another Perfect TV window the layout with the view of transversals that has to be cutted-off.